One of the overlooked collections held at the U. S. Library of Congress with their American Memory section are hundreds of panoramic maps of towns and cities across the United States and four Canadian provinces. They range from 1847 to 1929. Some of the maps are artworks drawn showing the streets and buildings of a town. 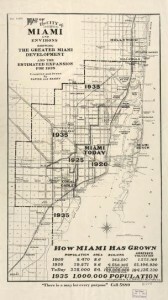 Key landmarks and buildings are illustrated and placed along the outlined the large maps. These maps were very popular in the 19th century and many times were referred to as ‘bird’s-eye views’. This collection of maps are in digital form for viewing on the Library of Congress site. The online site has the maps in JPEG or GIF format making it easy to view these large images. Searching for certain maps is made simple by a couple different methods. By placing a keyword or words, such as ‘world fair’ produced 13 different maps exhibiting the lay out of a town’s world fair. A search can be done by a geographic name; such as Quebec, Canada; Utah, Oregon, Kentucky or Florida in the United States. By click on one of those selections you can view what places the site has a map of. In the state of New York there are 204 maps, ranging in dates from 1851 to 1926. Once you locate an area, either from a list of names or from a gallery view, such as Coney Island in New York, you can zoom in on the image for more details. For Brooklyn, New York there are maps for 1879, 1897 and 1908. In Boston, Massachusetts, there are 11 different maps spanning 1870 to 1905, each one a treasure of details. There is a ‘Cities and Towns’ category which maps out towns and large cities across the world. Represented are London, Paris, Baghdad, Arkara, Calcutta, Berlin, Tokyo, Amman, San Juan and Havana, plus thousands of towns in the United States. 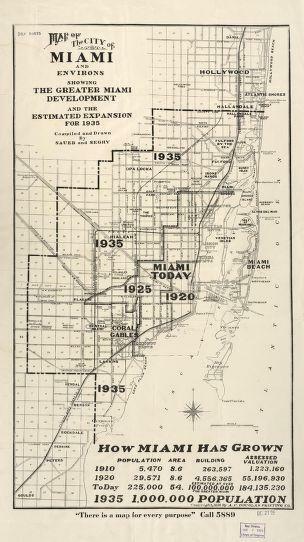 The sample maps are of Miami, Florida in 1935 showing the progress it made in urban development in the early 20th century. The panoramic map of Dallas, Texas in 1892 has numerous drawings of buildings along with some interesting advertisements for businesses in Dallas.